Back to Tulum by 4:00 pm! 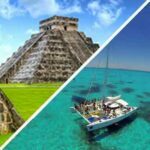 No trip to the Mayan Riviera would be complete without a visit to a genuine Mayan ruin, so come with us on this exciting Ek Balam tour that’s packed with excitement and mystery. This express Ek Balam tour takes the quickest route possible, so that you’re back at your hotel with plenty of time to enjoy the rest of the day. On this half-day tour, we’ll visit the remains of this spectacular walled city, where you’ll even be able to climb the magnificent pyramids to gaze out over the treetops! Your expert tour guide will show you the artwork and technology that this incredible city produced, before you’re whisked away to the colonial town of Valladolid to discover another side of the region’s history. Ek Balam is a very nice alternative option to Chichen Itza, as that ruins site is much more crowded and touristy then Ek Balam. Ek Balam also was more preserved and has a large amount of good quality inscribed buildings. At the beginning of your Ek Balam tour from Tulum, we’ll pick you up, and serve up a delicious continental breakfast on our way to the ruins. Just what makes Ek Balam so special? Put simply, it’s one of the best preserved Mayan cities of its kind. 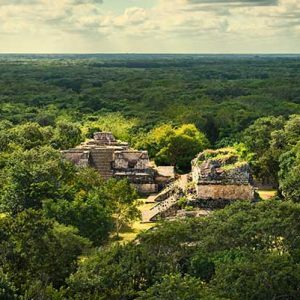 That means there’s so much that can be learned from it, and the Ek Balam ruins have therefore been a vital source of information for archaeologists looking to piece together the history and culture of the mysterious Mayans. On your guided tour, you’ll learn all about the people who called this city home, and what daily life was like for them. For instance, did you know that the Mayans were keen sports fans? It might seem strange, but the magnificent ballcourt provides some valuable insight into what the Mayans did for fun. Another reason why Ek Balam is the perfect place for tourists to visit is that it’s home to an incredible acropolis, which marks the final resting place of Ukit Kan Lek Tok’. When archaeologists first came across Ek Balam, this towering pyramid was completely covered in soil. However, after a lot of delicate digging, they finally uncovered this magnificent pyramid, which now dominates the site. Best of all, it’s one of the few pyramids in the Riviera Maya that you can actually climb! While the authorities have cracked down on climbing other, more well-known pyramids, Ek Balam has so far escaped their notice. 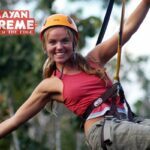 A key part of your Ek Balam tour from Tulum will therefore involve climbing to the peak of the pyramid, where you’ll take in an incredible panoramic view of the surrounding jungle. This is truly an unforgettable experience that’s not to be missed! 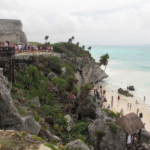 Of course, the Mayan period marks only one period in the rich history of this region. Once you’re all done with your Ek Balam tour, we will then move on to the town of Valladolid, which was originally founded by Spanish colonial settlers. While the town has continued to grow over the intervening years, there are still plenty of remnants of its colonial past. From beautiful churches to friendly, English-speaking locals, Valladolid is the perfect place to spend a few hours and take plenty of great photos while you’re at it! When the day is over, we’ll then take you back to Tulum, where you’ll have plenty of time to enjoy the rest of your day. In all, our Ek Balam tour from Tulum takes around 9 hours, and is the perfect way to soak up a whole heap of the local culture. Make sure you book your place today! Pick up at San Francisco Market approx. 8:55 a.m., Tour returns approx. 4 p.m.
Biodegradable Sunscreen, Eco Bug Spray, Money for tips, Comfortable Footwear, Camera, Water, Snacks. *You will receive your Ek Balam Express Tour From Tulum confirmation within 24 hours of purchase. Next day tours must be reserved by 7 pm, and confirmation will be expedited if available. For next day orders after 7 pm, or any other questions please email us at info@wonderousworld.com and one of our team will be happy to assist!